v.clean - Toolset for cleaning topology of vector map. v.clean allows the user to automatically fix topology of vector maps. Several tools may be listed to be executed sequentially. In this case, also the threshold parameter requires several values to be listed accordingly. An error map is optionally written which stores the erroneous geometries. The break tool breaks lines/boundaries at intersections and it also breaks lines/boundaries forming a collapsed loop. For example, 0.0;1.0;0.0 is broken at 1.0. Threshold does not apply (it is ignored), use an arbitrary value (e.g., 0) if v.clean is run with several tools. Hint: Breaking lines should be followed by removing duplicates, e.g. v.clean ... tool=break,rmdupl. If the -c flag is used with v.clean ... tool=break, duplicates are automatically removed. The rmdupl tool removes geometry features with identical coordinates. Categories are merged. If a point and a centroid have identical coordinates, one of them will be removed if both points and centroids are selected with v.clean ... type=point,centroid. The same applies for lines and boundaries. 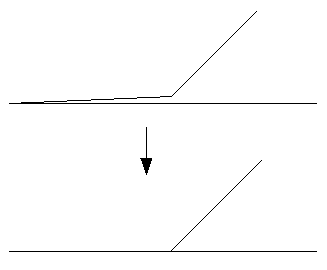 A line/boundary is considered to be a dangle if no other line of given type is on at least one end node. If a dangle is formed by several lines, such a string of lines is taken as one dangle and line lengths are summarized. The rmdangle tool deletes a dangle if the (combined) length is shorter than thresh or thresh < 0. If the combined length is larger than thresh, nothing is deleted. Threshold has to be given as maximum line/boundary length in map units; for latitude-longitude locations in degree. Dangles shorter than thresh are removed sequentially. All dangles will be removed if thresh < 0. With thresh < 0, only closed loops and lines connecting loops will remain. This is useful to remove all incorrect boundaries after other cleaning operations with thres is < 0. Areas can then be successfully built. To preferentially remove shortest dangles first, a first pass with a small thresh value can be followed by subsequent passes with higher thresh values. This can be done as one v.clean job by listing the tool several times and by defining a list of increasing thresh values. The chdangle tool is similar to the rmdangle tool, but works only on boundaries and changes dangling boundaries to lines instead of removing them. Islands and areas must be already clean, i.e. without dangles or small angles, e.g. v.clean ... type=boundary tool=rmdangle,rmsa,break,rmdupl,rmbridge thresh=-1,0,0,0,0. The snap tool snaps vertices to another vertex not farther away than thresh. If there is no other vertex within thresh, no snapping will be done. The type option can have a strong influence on the result. A too large threshold and type=boundary can severely damage area topology, beyond repair. Threshold gives maximum distance to another vertex in map units, for latitude-longitude locations in degree. Snapped boundaries may need to be cleaned with break,rmdupl,rmsa. If the -c flag is used with v.clean tool=snap, the sequence of break,rmdupl,rmsa is automatically repeated after snapping until no more small angles a left. Additional cleaning with e.g. tool=rmdanglemay be necessary. 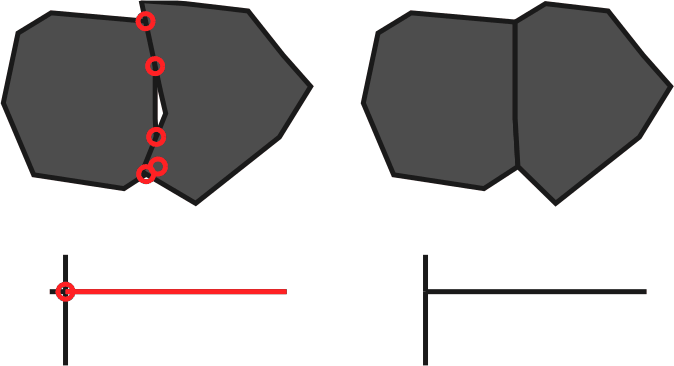 The bpol tool breaks boundaries on each point shared between 2 and more areas where angles of boundary segments are different and on all boundary nodes (start and end points of each boundary). The bpol tool behaves similar to break for boundaries, but does not break collapsed loops. The bpol tool is faster than the break tool but needs more memory. The bpol tool should be followed by rmdupl. If the -c flag is used with v.clean ... tool=bpol, duplicates are automatically removed. The prune tool simplifies lines and boundaries by removing vertices according to threshold. This tool preserves area topology, areas are never deleted and centroid attachment is never changed. v.generalize offers much more functionality for line simplification but does not preserve area topology. The rmarea tool removes all areas <= thresh. The longest boundary with an adjacent area is removed or all boundaries if there is no adjacent area. Area categories are not combined when a small area is merged with a larger area. Threshold must always be in square meters, also for latitude-longitude locations or locations with units other than meters. The rmline tool removes all lines or boundaries of zero length that may have resulted from other cleaning operations. Zero length boundaries are redundant and do not influence area topology. The rmsa tool only concerns angles which are so small that the calculated angle is 0. The following figure should help demonstrate what the tool does. The rmsa tool should be followed by break,rmdupl. The rmsa tool followed by break,rmdupl may need to be run more than once to remove all small angles. If the -c flag is used with v.clean ... tool=rmsa, the sequence of rmsa,break,rmdupl is automatically repeated until no more small angles a left. The user does not have to run v.build on the output vector, unless the -b flag was used. The -b flag affects only the output vector - topology is always built for error vector.